Two late touchdowns for TMP-Marian ended up being the difference, as the Minneapolis Lions fall on the road, 14-7. Minneapolis starting quarterback Junior Derek Freel was back in the lineup for the Lions. The Lions opened the game with the ball. They started the drive on their own 15-yard line. Minneapolis would keep the ball on the ground running 14 plays before Senior Tyson Villalpando carried it from 1-yard out to make it, 7-0. The drive took 7:38 off the clock. Neither team were able to get much offense going for the rest of the half and the score remained, 7-0, in favor of the Lions at the break. Defense continued to stay strong for both teams. As the fourth quarter began, the score was still, 7-0. Midway through the fourth was when the game shifted. 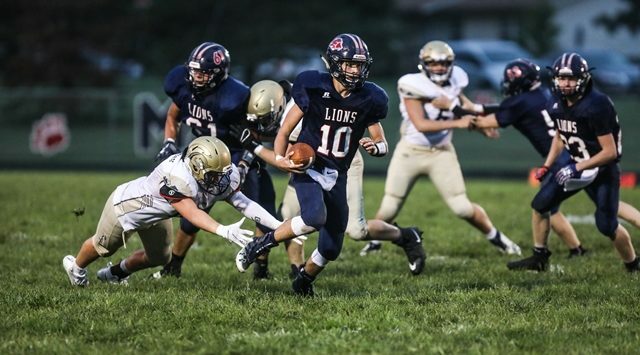 TMP completed a 34-yard pass from Junior quarterback Carson Jacobs to Senior wideout Bryce Hickman to put the Monarchs at the Lions 2-yard line. Senior running back Kaleb Hagans punched it into the endzone on the next play. Monarchs completed the 2-point conversions to take the lead, 8-7, with 4:50 left. Minneapolis went three-and-out on their next possession and had to punt with three minutes left. Hagans, then, carried it 54-yards on a 3-and-5 for a touchdown to extend the Monarchs lead, 14-7, with 2:25 left in the game. Senior Tristin Hauck led the way for Minneapolis. He rushed for 113 yards on 23 carries. Villalpando had 55 yards on 16 touches. Minneapolis is now 3-4 on the season and head to Phillipsburg next week for the regular season finale.